Long before jazz was cool, it was hot! The Polka/ Oktoberfest program contains Central European and other international walzes, polkas, marches, etc. We have 2 separate Oktoberfest programs, one more traditional and one more geared to more modern German “Schlager”.As with our other programs, it has both educational narrative and music. The around the world program focuses on fun and upbeat festival music from around the world. Music is a mixture of Jewish, Italian, German, and Central/ South American, with some interesting surprises added into the mix. This program focuses on the hit parade between 1914- 1918. It features Vaudeville and then-commercial Tin Pan Alley hits, ragtime and very early Dixieland and popular military music. We have several different WW I theme programs, featuring either popular music or featuring early Dixieland jazz. We have a good deal of repertoire this genre, focusing on either the golden era of Broadway music or a mixture of classic Hollywood anthems and Broadway songs. This program focuses on songs about the states. It includes both official and non-official state songs, as well as songs that are about states and mention states. Patriotic music can easily be incorporated into this list for holidays. This list is generally played on or around St. Patrick’s Day. It includes Both Irish and Irish-American music, including marches, jigs, waltzes and other popular Irish novelties. This program focuses on music from the Victorian Era, from pre-Civil War up into the beginning of the 20th Century. It contains, ballads, dance hall, waltzes, ragtime, marches and other popular music of the era. 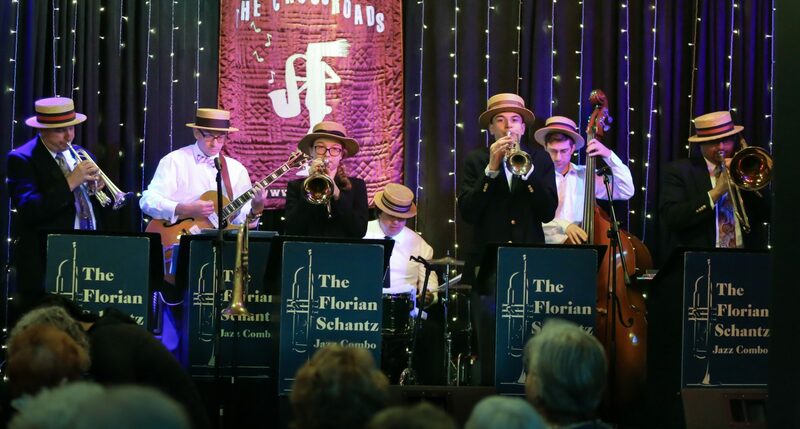 A completely unique historical and educational program developed and performed by the Florian Schantz Jazz Combo, Four Centuries of Jazz takes the audience on a journey through time, exploring music from the 1700’s up through the modern era, set to traditional jazz. Many songs are played on antique instruments that are authentic to the times the music was written. The program was first delivered for the Miller-Cory House benefit concert to a sell out crowd at the Crossroads but has since been delivered at libraries and historical societies. These programs focus on popular music of the 30’s and 40’s, including swing, ballads and other popular standards. Although many of us think that the 1960’s only consisted of the Beatles and Jimi Hendrix, the decade also marked the peaks of careers of great commercial musicians and arrangers like Al Hirt, Herb Alpert and the Tijuana Brass, Bert Bacharach and Henry Mancini and Ray Conniff. This program shows the lighter, instrumental side of the 1960’s featuring a number of contrasting styles. Our children’s programs are either traditional jazz programs with education content targeted for children or programs with music that it tailored specifically for younger audience. However, this music would also be very suitable for adults. We do Winter-themed/ holiday programs playing either traditional arrangements in an all brass choral format or in a jazz combo setting. Programs at church services with traditional hymns, jazz arrangements, or traditional arrangements with tasteful embellishments. Also available for chorale Christmas music. Of course we can also tailor programs to be a mixture of all of the above or put together customized set lists. Please contact us if you have a specific need.